President Muhammadu Buhari will today (Friday) leave Abuja for Paris, France where he will be participating in the first edition of the Paris Peace Forum, taking place between November 11 and 13, 2018. This was disclosed in a statement on Friday by the Special Adviser to the President on Media and Publicity, Femi Adesina. He will also join other world leaders to commemorate the centenary anniversary of the Armistice signed on November 11, 1918, between the Allied Forces and Germany in the forest of Compiegne in France to end the First World War. 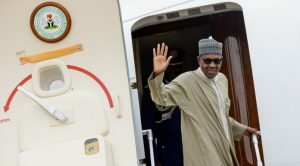 Accompanying the president on the trip are the Governors of Katsina, Anambra and Ekiti States Aminu Masari, Willie Obiano and Kayode Fayemi, respectively. Others include the Minister of Foreign Affairs, Geoffrey Onyeama; the Attorney-General and Minister of Justice, Abubakar Malami; the National Security Adviser, Maj-Gen. Babagana Monguno (rtd); and the Director-General, National Intelligence Agency, Ahmed Abubakar.